MISD's Winter 2018/2019 Magazine is Now Available! 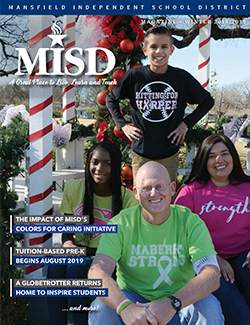 In the winter 2018/2019 Mansfield ISD Magazine, the impact of the district’s Colors for Caring initiative is explained through personal stories of triumph and support. Plus, tuition-based pre-kindergarten classes are coming to Mansfield ISD in August 2019. See how to register your 4-year-old into a half-day class. There’s also a story about a Harlem Globetrotter who returned to her former MISD high school to inspire other students to achieve their dreams.